Exit at the “Seriate” interchange, follow the signs for “Lago di Endine, State Road 42 of the Tonale and the Mendola and then the signs for “Passo del Tonale”. In Edolo continue towards Passo del Tonale for approximately 15 km. Exit at the San Michele all’Adige-Mezzocorona interchange and follow the signs for “Passo del Tonale” State Road 42 of the Tonale and the Mendola. When you reach Passo del Tonale, continue for approximately 12 km. Take the A4 Motorway and exit at the Brescia Ovest (West) interchange, follow the signs for “Lago d’Iseo” - “Vallecamonica” and then “Passo del Tonale” following State Road 42 of the Tonale. 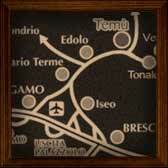 In Edolo continue towards Passo del Tonale for approximately 15 km. To contact us and book you can call or write an e-mail, specifying the dateof arrival and departure, number of people, the type of request and anyoptional services.